Welcome HomeAway and VRBO users. You will not be assessed BOOKING or Service FEES on this site, and our communication will never be hindered here...Feel free to email me with questions via this website at any time. I'll respond quickly. Our beach house is steps to Harwichport shops and restaurants as well as the warm water beaches of Nantucket Sound (without crossing busy Route 28 or Lower County Rd.) Highly desirable walkable location on quiet, private/dead end street. Bring your bathing suits, paddle boards, bikes, fishing rods & jogging shoes as the best little neighborhood for fun is at your door. Graciously appointed with all the comforts of home. Immaculately clean and fresh upon your arrival. Custom built year round home has central AC, WiFi internet, convenient first floor full size washer/dryer, dishwasher, microwave, fully outfitted stainless steel appliances and granite kitchen. All bed linens, bath and beach towels included. To ease you into vacation mode, we also provide toilet paper, tissues, hand soap, trash bags, dish soap, dishwasher tabs, paper towels, napkins, and many often used condiments. 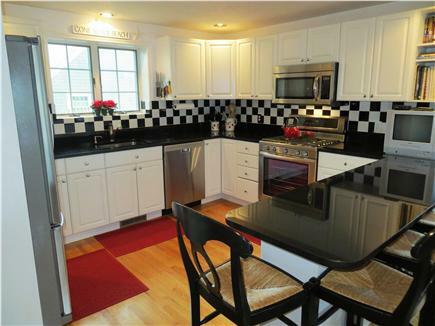 Three Bedrooms & 2 full baths upstairs, 4th bedroom in finished basement. Total turn-key rental includes: all bed linens, bath & beach towels, beach chairs, beach umbrella. High-Speed WiFi. Fully stocked gourmet kitchen. Laundry room with full sized washer/dryer, and ½ bath on first floor. Outdoor hot water shower, blue stone patio, new Weber gas grill. This custom built 4 bedroom, 2½ bath beach house is well equipped and situated on a quiet, secluded dead end street South of Lower County Road and Route 28. Take walks into town or to the beach from this super convenient location..... When the hot humid New England nights leave you sleepless, hot and sticky, turn on the Central air conditioning for a refreshing night's sleep. The master bedroom has a King bed, 2 walk in closets, full private ensuite bathroom and fully stocked linen closet. The back bedroom has 2 twin beds, a full size crib, and a double closet. The front bedroom has two beds - a full and a twin, as well as a large double deep closet. On the main level, the spacious and fun black & white kitchen is fully equipped...Granite counter tops, 2 pantries, new 2014 stainless steel appliances and if needed, a high chair. The granite breakfast bar seats four while the stylish Pottery Barn dining table seats six. The kitchen is fully stocked with cooking and baking tools and will Pamper any chef....Gas cook top & oven, built-in microwave, blender, toaster, coffee maker, platters, trays, salad spinner, garlic press, lobster pot/forks/crackers, wine glasses & bucket, sharp knives and other gourmet accouterments. To ease you into vacation mode, we also provide toilet paper, tissues, hand soap, trash bags, dish soap/dishwasher tabs, paper towels, napkins, and many often used condiments. The built-in kitchen bookcase not only offers a great selection of cook books and Cape Cod vacation guides, but also a helpful Renters Guide complete with information on area attractions, ferry schedules and restaurant menus. 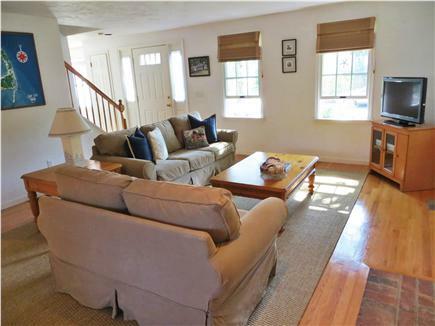 The comfortable Family Room centers around the wood burning fireplace and the new Flat Screen HDTV. Lounge on one of the 2 new Pottery Barn sofas or relax in the reading nook on the ''big man chair'' with ottoman. Here you'll find a nicely stocked book case with games, magazines and books for kids and adults alike. The kitchen, dining room and family room have hardwood floors throughout. The tiled full sized laundry room with private half bath are also on the first floor. The fully carpeted finished basement bedroom (two twin beds) complete this beautiful beach house. The outdoor amenities.....bluestone patio with new Weber Gas grill, teak dining table/chairs/umbrella plus 2 Adirondack chairs, a fully enclosed hot/cold outdoor shower with private entry to the house and an in-ground irrigation system for an always lush green lawn. The large garden shed stores beach chairs, beach umbrellas, boogie boards and toys for your comfort and enjoyment. Convenience abounds - the village of Harwichport --> all within walking distance: CVS, Dunkin Donuts, US Post Office, 2 banks, gift shops, Hot Stove Saloon, Ember Coal Fired Pizza & Wings, Cape Sea Grille, The Port restaurant, Perks Coffee, The Mason Jar, George's Pizza & The Sundae School. A short drive away is George's Fish Market, Star Market, Harwichport Golf, trampolines, Batting Cages, Bumper Boats, Go-Carts, Cape Cod Rail Trail-bike path, Harwich Mariners Baseball, Allen & Saquatucket Harbors, & Freedom Cruise Line High-Speed Nantucket Ferry. Please note: So that we do not have to disappoint people, your signed Rental Agreement with deposit secures your reservation. Additional availability info: Your signed Rental Agreement with 50% deposit secures & confirms your reservation. This is a Saturday to Saturday vacation rental. Additional pricing info: Acceptable payments:Personal check, Zelle.$150 taxable cleaners fee deducted from security deposit. State and local taxes of 12.45% will apply. Vanessa and family, we are so glad you’ve enjoyed your time at our Harwichport beach house! We appreciate the care and respect you show our property and look forward to welcoming you back again in the future. Thanks for taking the time to submit your review. This is our 3rd time staying at this location in Harwichport, and we absolutely LOVE it! The home is perfectly appointed for our family of 7. Besides the groceries and our clothing and toiletries, there was nothing we needed to bring. We walked to town for shopping and dining, we walked to the beach for relaxation, and we enjoyed our family time together. 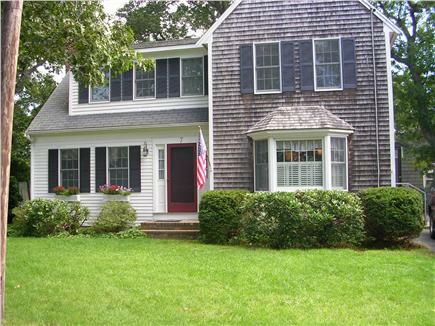 Cathy and Martin, we are so glad you and your family enjoyed your Cape Cod vacation and time spent in our home. Thanks for taking such great care of our place.....and thanks also for taking time to write your thoughtful review. We look forward to hosting you on the Cape again in the future! 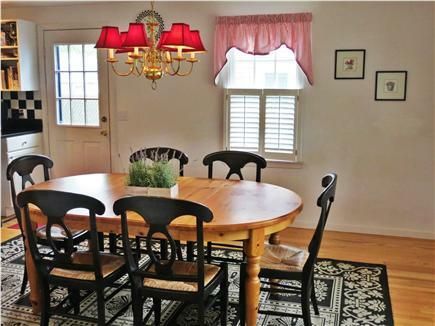 Over the years we have vacationed at several nice homes in Harwichport. This was, without a doubt, the best in terms of having everything a Cape Cod vacationer would possibly need or want. Everyone in our family liked the home; in fact our daughter-in-law thought it would be nice for us to buy this rental. It was the perfect vacation home for us, our son and daughter -in-law and our 2 year old twin grandchildren! Dan and Kathy, we are delighted you enjoyed your stay with us. Thanks for taking such excellent care of our property. We look forward to seeing you again in the future. Enjoy the rest of summer. Paul and family, we are so glad you enjoyed your stay in Harwichport and especially at our home! We look forward to hosting you again in the future. Thanks for taking time to submit your review. This was our second time staying at this property and it was once again wonderful! The home has everything you could need or want, it is fully stocked with towels, pots & pans, and beach supplies. The home is large enough where someone could sneak off and nap while not being distracted by a family game in another room. The location is phenomenal -- walk to the beautiful beach, or in to town, you can’t beat it! So many new family memories made. Truly a magnificent family vacation! Vicki and family, It was a pleasure to share our home with you, and we are delighted you had such a wonderful visit. You treated our home with care and respect and we welcome you back anytime. Thanks for taking the time to review your stay with us. Great stay - will be back! We are so glad you enjoyed your time in Harwichport and at our home. You left our home in beautiful condition and obviously treated it with care and respect. We look forward to hosting you again in the future! We've been staying at this property for 20+ years and counting! My family has been in the hotel in restaurant business on Cape Cod for more than 50 years where I worked many a summer during my youth. As a hospitality insider let's just say my standards are very high. With a young family of my own I wanted to stay in a "cottage" and was thrilled to stumble upon this gem when looking for a rental years ago. I've rented this lovely home in summer, fall and winter. It's hands-down our favorite spot. This house is absolutely impeccable, in fact when my brother stopped by for a visit his jaw dropped as he commented, "This is a rental? I'd love this as year-round home!!" Marilyn has paid attention to every detail imaginable. From the well-stocked kitchen where she has regularly replaced and updated appliances over the years, to the beautifully decorated common areas, as well as the pretty bedrooms. Note: I've had several back surgeries and the mattresses are extremely comfortable. Fabulous!! Marilyn has taken the time to compile a binder listing house details, phone numbers one might need, beach and restaurant info , area highlights, etc. In addition, she lives nearby and is always at the ready to help if needed. She's a truly pleasant hostess who goes above and beyond in every way!! In addition, the location is perfect! My twin daughters were 2 years old when we first started renting here. As they grew, the quiet, safe neighborhood was perfect for riding tricycles to bikes, and we've always been grateful for the easy, very short stroll to the beach. My girls (now 22, wow!) and my husband and I love the walk to town with its variety of fabulous shops and great eateries. We've also frequented the the art shows on the Green and music in The Port!! Cheryl and family, we’ve so enjoyed hosting you at our home all these years and look forward to many more. Thank you for taking such wonderful care of our property and for taking time to write your thoughtful review. Our best to you, Mike and the girls. This house was an awesome spot for our family week. We had plenty of space to sleep, it was a 2-5 min walk to the beach (we looked on our GPS when we were seeing which way to the beach and it’s literally 900 feet from the house to the beach. ), and walking distance to the coolest little downtown in Harwitchport. A short drive to the ferry where we headed to Nantucket made this place really unbelievable. Whenever we go to a rental we are worried it won’t be “as advertised,” but this place was EVEN BETTER!!! My wife was kind of upset that it was decorated nicer then our real house. The place was beautiful inside and out! The house is on a dead end street so it was perfect for the kids. They could play in the yard without cars flying through (this also meant it was nice and quiet). The finished basement with bedroom was a big plus! The teenager was able to “sleep in” down there without us waking them up to early!! The kitchen was AMAZING for cooking so we didn’t have to eat out every meal. The kitchen wasn’t just fully equipped, but it was a step above that. The outdoor shower (something we look forward to all year) was perfect to hop into after walking home from the beach. Marilyn, the owner, was so pleasant, nice, and easy to deal with. The place was spotless!! We have been coming to the Cape for years, and this house was by far the nicest rental we have ever stayed in...above and beyond in every way. Charlie, Melissa and family, we are so glad you enjoyed your Cape Cod vacation and time spent in our home. Thanks for taking such great care of our place.....and thanks also for taking time to write your thoughtful review. We look forward to seeing you on the Cape again next summer! If you are looking for a relaxing vacation, this is not the home for you. We have been renting on the Cape for over twenty years, including a decade with one home and six years with another, and have never received a single complaint - until Marilyn. We rented this home for three years and each year we'd receive some nit picky complaint after we left, like there's sand in the tub. We went above and beyond to treat the house with care - such as no wet suits, sweeping daily, watering the flowers, and yes, wiping out the tub - but she was never satisfied. Also, the quality of the house declined over the time we were there - downstairs bedroom was musty last year, sparse shower head in bathroom that is mostly clogged and "antique" dresser in bedroom that smells so bad that clothes have to be put on floor in closet. This is a sad case of sour grapes. This family enjoyed our home for the past 3 years without complaint and, in fact, wanted to come back for another two weeks in 2018. It was only after we decided not to rent to them again that they attacked us with this review. We have shared our home with 100’s of guests for 20+ years and have never had a single complaint. We had a few minor issues with the condition this party had left the home over the past few years, but this past summer, they left our home in such an unacceptable state that we decided not to rent to them again. We provide a late check-out time (noon) so our guests are not rushed in their departure, and we are totally fine with “normal wear and tear.” This family decided to leave several hours in advance of the noon check out without performing many tasks agreed to in the lease. The amount of extra work required to prepare the house for our next guests after this family’s departure (tons of sand everywhere, the dryer so overstuffed with SIX sets of bed linens that it wasn’t working properly, garbage not disposed of properly, etc. ), however, made it clear that the condition was not acceptable (and in breach of their rental agreement.) Only after we notified them on 11/25 in a respectful manner and with plenty of time to find another rental for 2018 did they decide to attack us. Our week in Harwichport did not disappoint! This adorable house is extremely well appointed with all the comforts of home, and it fit our family of 6 perfectly. The location is ideal -- a short walk to the beach and a short walk to town. We parked our cars and forgot about them for seven days (except for the short ride to the golf course). Our family's reunion/vacation was idyllic, and we can't wait to visit again. Cathy, It was a pleasure to share our home with you, and we are delighted you had such a wonderful visit. You treated the property with care and respect and we would welcome renting to your family in the future! Thanks for taking the time to review your stay with us! As a child, our family vacationed in this charming neighborhood. We were fortunate to purchase the original cottage, which used to stand here, in the late ‘70’s and then re-built our year round home seen here in the early ‘90’s. We spent our summers in the new house when our kids were young and we now offer to share it with you to make your Cape Cod vacation memories. We’ve loved this location for over 40 years. It’s an easy stroll to the family friendly Atlantic Avenue beach and a quick walk into town for coffee, CVS, US Post Office, restaurants, bars and shops. Since we’re on a dead end street, your vacation is peaceful and private. Our beach house is meticulously maintained and always clean and fresh for you. We are readily available, during your stay, for any questions you may have. We are a total turn-key vacation rental.....not only is the home stocked with bed linens, bath & beach towels, beach buggy, chairs & umbrellas, to ease you into vacation mode, we also provide toilet paper, tissues, hand soap, trash bags, dish soap/dishwasher tabs, paper towels, napkins, and many often used condiments. A ''Renters Guide'' book will acquaint you with the ins and outs of our home and Harwichport. 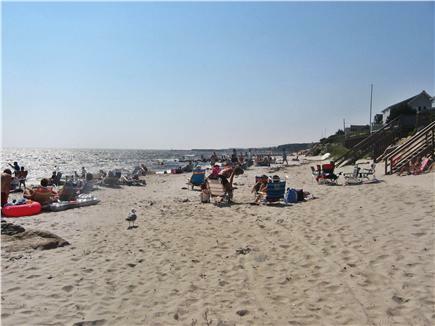 Harwich is conveniently located just before the elbow of the Cape. 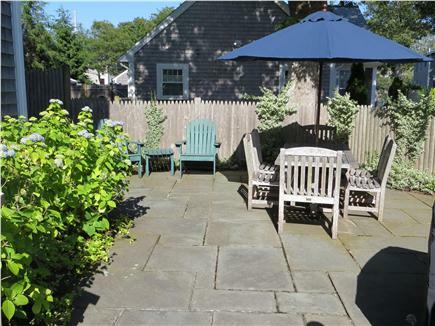 We’re convenient to Hyannis as well as Provincetown and all points in between. The Freedom Cruise line, just down the street, offers seasonal daily ferry service to Nantucket Island.